Carmie is a talker. So she is my spokespaca for the gang. She will focus in on each alpaca on the ranch.Her story is coming up, but first things first. Know nothing about alpacas? That was me four years ago. Business partner Sherri suggested we give it a try. We did the research- a must. Then we went to look. First I found out what a great community the alpaca ranchers are-wonderful people. Alpacas can be quite pricey, depending on your interests. I had no idea what I was doing, so we started with “fiber” animals. Less expensive and we wanted to see what they are like. You can’t have just one alpaca, kind of like potato chips- actually, they are herd animals, and need that companionship. So we got the three amigas. Two Huacayas and one Suri- different species of alpaca- see glossary if you are new to this stuff. 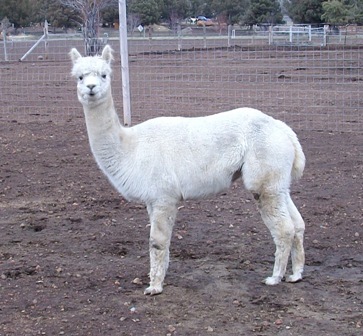 Sandeen’s Liberty Belle is a nice big girl, Huacaya, white. She can’t seem to get pregnant, so she was sold as a fiber girl. She is now 10 years old, and still has fab fiber for yarn! She is regal looking, isn’t she? Every animal has its own personality, and she is a lookout. She keeps an eye on things. And she taught me about alpacas! They don’t spit at people, they have two toes that need trimming once a year (not as hard as you might think) , only have teeth on the lower jaw, have three stomachs, they usually hum, but can sound almost like a chicken if they are afraid of something. Say hello to Liberty Bell.